One way Conspirare shares the power of choral music is through Craig Hella Johnson’s teaching and conducting. 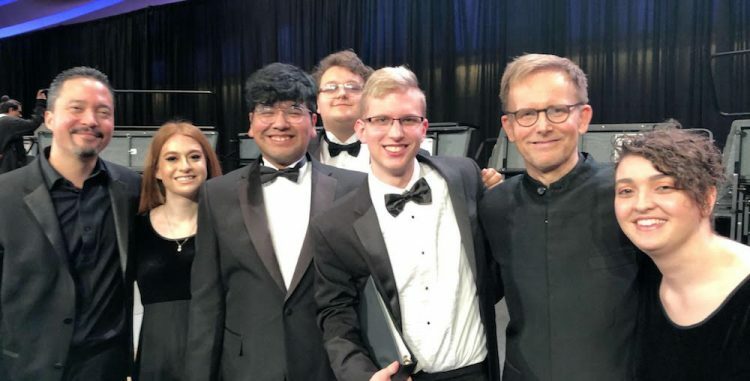 Recently, Johnson served as the conductor for the Texas Two Year All-State Choir; an auditioned choir made up of students from 2-year colleges across Texas. This choir is part of the annual Texas Music Educators Association Convention. Nick Robertson, a freshman at Alvin Community College, says the experience was life-changing and reminded him that music is more than just theory and technique. The Two-Year College All-State Choir performed “All of Us,” an original composition from Craig Hella Johnson’s oratorio “Considering Matthew Shepard.” Listen now. Nick is pictured above next to Craig (left), along with fellow all-state choir students.